The most anticipated day has arrived. Today is a day that is bigger than any day, forget about Black Friday, forget about the Champions League Final, forget about any other major football event. Today Nike presents their highly popular EA Sports boot, which this year includes the new and popular PhantomVSN boot, while making the digital boot a reality. In 2016 we saw the first ever Nike x EA Sports football boot. 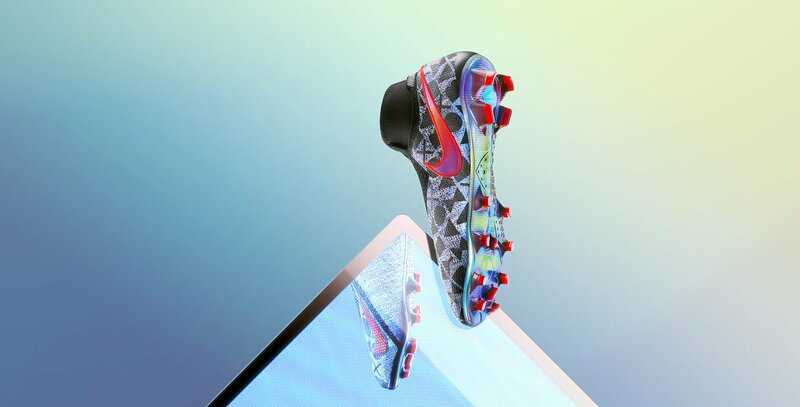 Here Nike launched a pixelated Mercurial Superfly that featured an 8-bit graphical design. Following up on their success Nike launched their second Nike x EA Sports football boot, by making the Hypervenom 3 with a Real Player Motion Technology design; sounds very fancy, and this was a technology that EA Sports used in their games. This year has taken a bit different path when we taking a look on the Nike x EA Sports PhantomVSN football boot, as it comes with an awesome design, inspired by the controllers used for the most popular sports games ever. When you look on the new Limited Edition boots, you might think that Nike has toned a bit down on the design of the EA Sports boots, but this is not the case at all. The Nike x EA Sports PhantomVSN boots are made with a stunning reflective upper, while also containing a nice graphical design of one of the most important thing when gaming: The controllers. Nike has included the buttons from the PlayStation and XBOX controllers, which is a bit different considering the themes from the two previous EA Sports football boots. But it still gives a nice sense of the virtual and gaming world in general. The Nike x EA Sports PhantomVSN are just as you would expect them to be: Crazy! Besides the awesome reflect design, Nike also added a red Swoosh and studs, which fits perfectly to the boots. The most eye-catching, besides it being an EA Sports football, is the extra shiny soleplate. The reflective design from the upper is incorporated into the soleplate, which makes it one of the most awesome soleplates from Nike. I can’t imagine anyone would take their eyes off you on the pitch, when you run around in these Nike football boots. Despite this being a Limited Edition, Nike have still for the first ever made these boots in Academy pricepoints. Last year they introduced the EA Sports football boots in kids’ sizes, which they also have included with the PhantomVSN version, and this year they’ve just made the boots available for even more people. All price points of the Nike x EA Sports PhantomVSN will still be featured as Limited Edition, even though it comes in different price points. The Nike x EA Sports PhantomVSN will be worn by some of the most creative Phantoms of the game, so expect seeing Kevin De Bruyne, Bernardeschi and Fran Kirby playing in the boots the next couple of weeks. We can’t wait for the showcase to begin! Secure your pair of the highly popular Nike x EA Sports PhantomVSN exclusively at Unisport from the 12th of December! Sign up for the Limited Edition Nike x EA Sports PhantomVSN boots here.